I love waking up to a warm cinnamon roll. This easy cinnamon rolls recipe is a great tasting way to make quick cinnamon rolls that start the day off right. 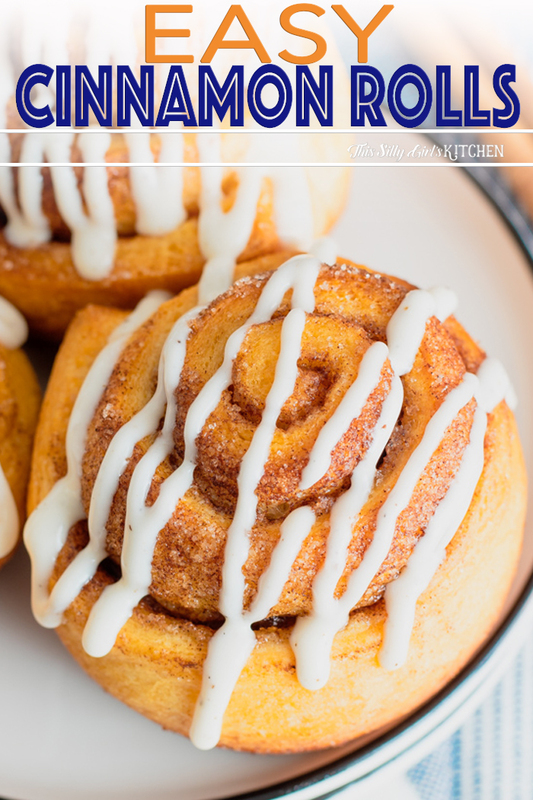 I know you are going to love this Quick and Easy Cinnamon Rolls Recipe! Very few things are quite as good to wake up to in the morning as a beautifully made cinnamon roll. The sweet and spicy balance of just the right amount of cinnamon and sugar blankets a sheet of dough. Le sigh. Click here for my Cinnamon Cream Cheese Cookies! The rolled up frosted treat is the perfect indulgence whether you are rushing out of the house, or enjoying in a leisurely morning. 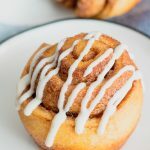 This easy cinnamon rolls recipe is a great tasting way to make quick cinnamon rolls that start the day off right. You are not going to believe how easy they are! So what makes this particular cinnamon roll recipe quick and easy? 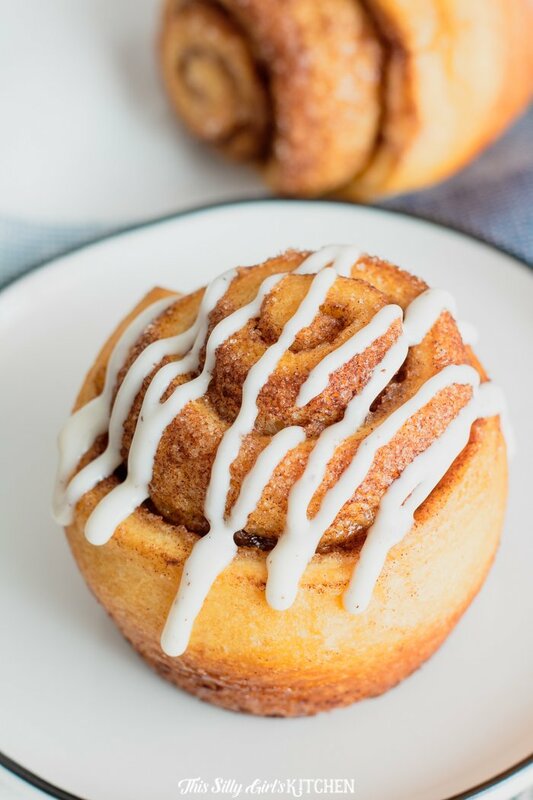 The secret to this quick cinnamon roll recipe is using crescent roll dough! How to make quick and easy cinnamon rolls? Preheat the oven and roll out your crescent roll dough sheet on a clean work surface. Brush the dough with melted butter (yum!) and dust the dough with our cinnamon sugar mixture. It seems like too much – it’s not, use it all! Roll up the dough and cut it into even pieces. Place each piece into a greased muffin tin section. Bake until golden brown deliciousness – top with gooey homemade cream cheese glaze! 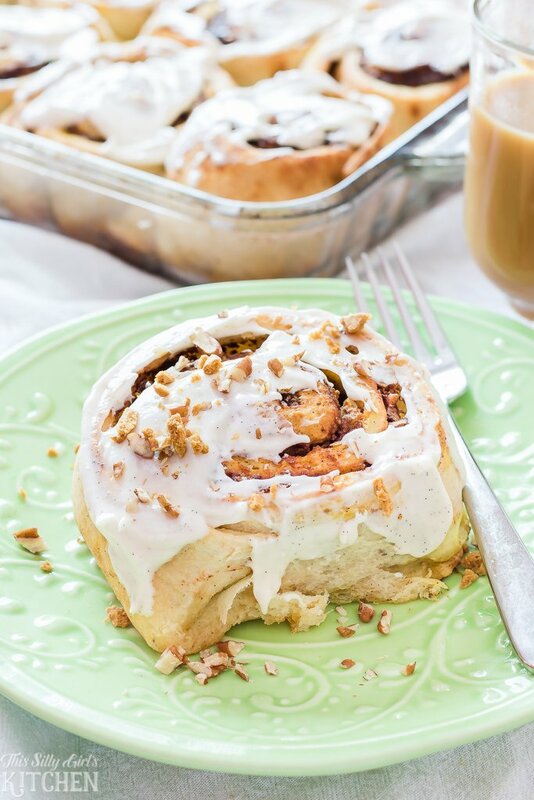 Try my Apple Cinnamon Cream Cheese Roll-Ups next! HOW DO I KEEP CINNAMON ROLLS FRESH? Cinnamon rolls are more a challenge to keep around than they are to preserve. You can keep them at room temperature for a couple of days, or even in the refrigerator for about a week. For maximum freshness, delay topping the cinnamon rolls with the cream cheese glaze until you are ready to eat them. My easy cinnamon rolls recipe includes the most amazing cream cheese glaze topping. HOW DO YOU SOFTEN HARD CINNAMON ROLLS? If your cinnamon rolls are too cold, then simply let them sit at room temperature. 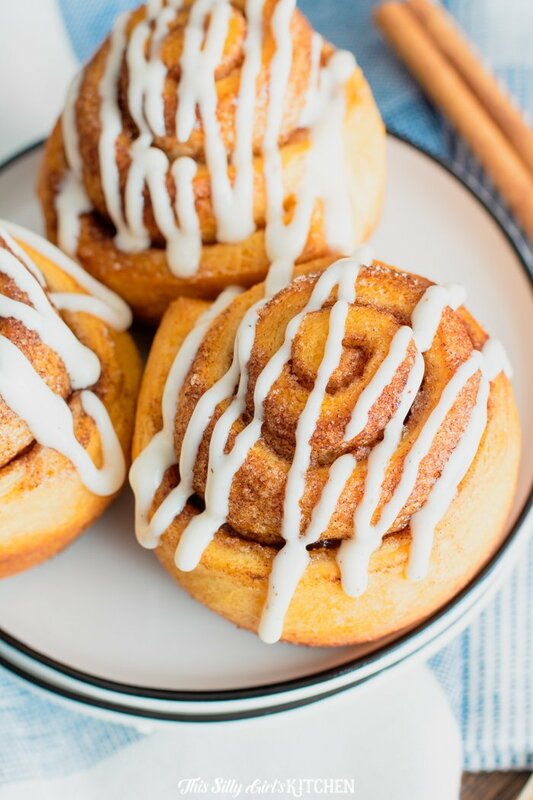 To warm up and soften for quick cinnamon rolls, wrap them in a moist towel and warm them up on a baking sheet in the oven at 350°F for about 7 minutes. HOW LONG CAN YOU REFRIGERATE UNCOOKED CINNAMON ROLLS? Luckily for this easy recipe, we are using store-bought crescent roll dough. But, the best practice for storing uncooked dough in your refrigerator is to use it up within 2-days. However, if you need to, you can push it for up to 72 hours. If you wanted to just prep the dough with the seasoning according to my cinnamon rolls recipe below and not bake it yet, cover the dough tightly with plastic before refrigerating. How about Cinnamon Sour Cream Coffee Cake?! HOW DO YOU UNFREEZE CINNAMON ROLLS? If you choose to freeze these easy cinnamon rolls, then make sure you wrap them tightly and thoroughly with plastic wrap or aluminum foil. For the best results only freeze unglazed cinnamon rolls and later apply the icing just before serving. CAN YOU REHEAT CINNAMON ROLLS? Cinnamon rolls can be reheated, although it is best to enjoy them fresh! Don’t overheat the cinnamon rolls, or the bread will harden as it cools. You can reheat frozen cinnamon rolls after first thawing out for best results. 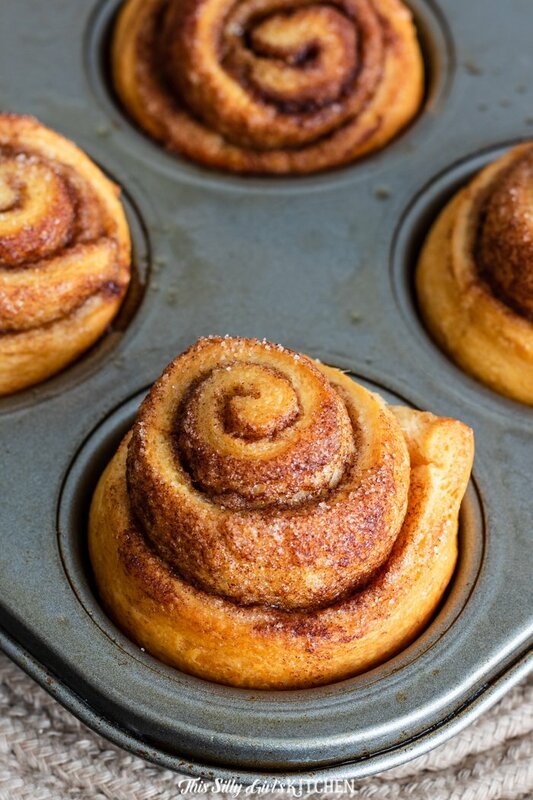 To reheat room temperature cinnamon rolls, you can use the oven or the microwave for quick cinnamon rolls. HOW DO YOU REHEAT CINNAMON ROLLS IN THE OVEN? To reheat cinnamon rolls in the oven, cook covered at 400 for about 10 minutes or until heated throughout. The oven is the best way to reheat cinnamon rolls and it is really important that you remember to keep them covered so that the rolls do not dry out. HOW DO YOU HEAT UP CINNAMON ROLLS IN THE MICROWAVE? You can heat up your cinnamon rolls in the microwave for a faster cooking time, but I recommend finishing the warming process in the oven anyway to get a nice crust. If you microwave cinnamon rolls, be sure to just cook one at a time for the most consistent results. You only need to put them in for about 30-45 seconds with a moist paper towel covering them, or less. Finish them off for a minute or two in the oven. WHY DO CINNAMON ROLLS FALL IN THE MIDDLE? Cinnamon rolls, like other baked breads, rise and expand as they heat up in the oven. Hot air fills pockets in the dough which makes the bread fluffy and soft. As steam escapes the blocked dough, the cinnamon roll begins to deflate in the center. HOW LONG SHOULD CINNAMON ROLLS COOL BEFORE ICING? Top your cinnamon rolls immediately with cream cheese glaze by drizzling a tablespoon over the center of the cinnamon roll. Then spread the glaze over the top in circular motions using the back of the spoon to create a coat. Continue adding more layers to your preference to get the optimal icing for cinnamon rolls. Don’t forget to make our Roasted Pecans with Cinnamon Sugar next time! The crescent roll sheet is a rectangle, with the shorter side facing you, roll it up tightly into a roll. Slice into six even pieces with a serrated knife. Grease six sections of a muffin tin well with cooking spray or more butter. Place each of the rolls cut side up into each section. Bake for 11-15 minutes or until rolls are golden brown. Place muffin tin on a wire rack and let cool. While the rolls are cooling, place the softened cream cheese in a medium-sized bowl and cream until smooth with a hand mixer. Add the powdered sugar and vanilla, mix to combine. Add the butter and mix to combine until smooth. Add the milk one tablespoon at a time until desired consistency. The glaze should be thick but pourable. Take the rolls out of the muffin tin, glaze rolls, serve while still warm.